InsideOut Yoga is a space for connection. A space to connect body, mind & spirit. A space to connect with others in an inspiring and accepting community. We practice in the light-filled sanctuary of the Unitarian Universalist Fellowship of the Rappahannock (UUFR) which has a wooded backdrop. When the weather is nice, we practice on the waterfront stage of YMCA/APYC Camp Kekoka with views out to the Chesapeake Bay. 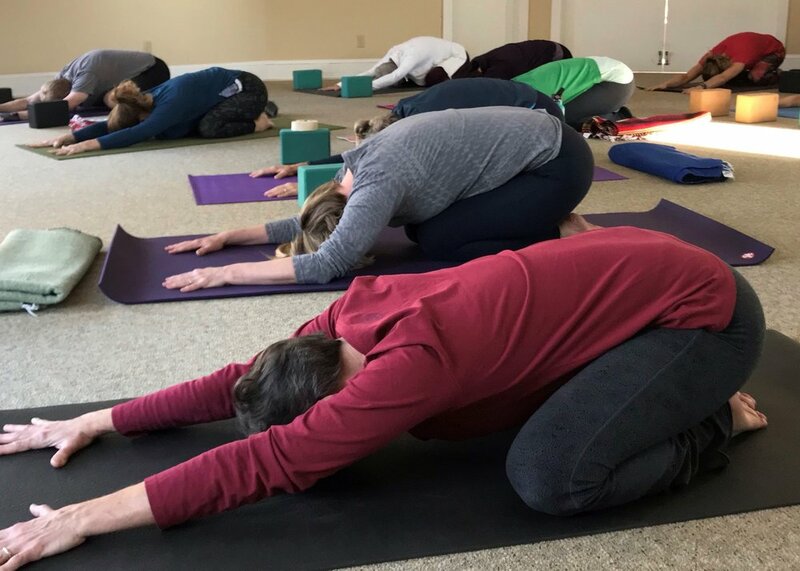 In each class, you'll receive individual attention in a group setting with thoughtful, intelligent instruction that will move you forward in your practice and in your life. BRAND NEW TO YOGA? EXPERIENCED YOGI? There are a variety of classes for all levels of ability. From Yoga for Healthy Aging to Power Flow, you'll learn to challenge yourself, but to honor the wisdom of your body as you work within the limits of your individual flexibility, strength and stamina. Our mantra is no pain, no pain! PREFER PRIVATE SESSIONS? Jump start or overcome a plateau in your practice by booking a private or semi-private lesson based entirely on your needs! Or book a fun class for a special occasion such as a birthday, bridal shower, wedding party, family reunion, graduation, going away party, office party, and more. QUESTIONS? If you have any questions about our classes, please review the class descriptions or check out our happenings. If you're new to yoga, there are some great tips to keep in mind. You can get to know some of the people you'll be practicing with better by reading our Yogi of the Month interviews. View our class schedule here, find a workshop here, and learn about our retreats here. If you can't find what you're looking for, please feel free to email, or call/text me at 804.436.2204. I love talking about yoga!